Members of the Garden Center Association of Central New York gathered at Nine Mile Creek Tuesday to plant an American sycamore tree in honor of Earth Day. 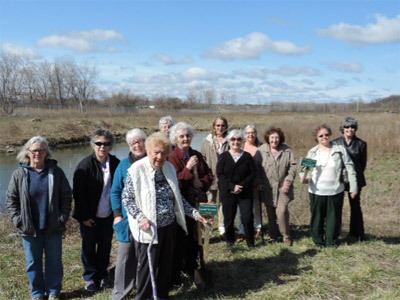 The group chose the location because of its proximity to restored wetlands at Nine Mile Creek and a public canoe launch, which is slated to reopen later this year. The Nine Mile Creek cleanup was completed in 2014, and the area is now a thriving ecosystem and part of a green corridor connecting Onondaga Lake to upland areas. The area features 30 acres of enhanced wildlife habitat and is home to more than 80 fish and wildlife species. Members of the Garden Center Association of Central New York at the tree planting event. The American sycamore is a large native tree well-suited for stream banks and wetlands because its root system helps prevent erosion. The tree will provide a nesting site for squirrels and birds, as well as shade and shelter for other animals. Sycamore trees typically grow 75 to 90 feet high, reach maturity at around 25 years and their full height at 30 to 50 years, depending on growing conditions. Sycamore trees are successfully growing in the Onondaga Lake watershed, enhancing the native plant community and contributing to a more biodiverse ecology in the restored wetlands. Community members who are interested in preserving and protecting the Onondaga Lake watershed are invited to become members of the Onondaga Lake Conservation Corps. The Corps seeks to inspire future stewards of Onondaga Lake and its watershed through a hands-on, experience-based program that offers citizens and organizations the opportunity to participate in activities that help restore and sustain Onondaga Lake and its value as an Important Bird Area. Since its formation in 2012, more than 600 community members have participated in Corps events. Left: Corps volunteers Ross and Grace Getman, of Syracuse, remove water chestnut at an event in August 2015. Right: Corps volunteers display a bird box at a Corps event in May 2015. The bird boxes were built and installed at the event to create shelter for birds and other wildlife. To learn more about the Onondaga Lake Conservation Corps or participate in future activities, please contact montezuma@audubon.org or call 315-365-3588. Like the Corps on Facebook or visit YouTube to learn more. The community also is invited to attend free open house sessions at the Onondaga Lake Visitors Center to learn more about the Onondaga Lake cleanup. The Visitors Center, designed and built by Honeywell, provides public access to the significant work taking place by hundreds of scientists, engineers, and skilled craft laborers from the region. Public open houses are held Fridays 12-4:30 p.m., from mid-April through mid-November. For more information on scheduling a tour, please call 315-552-9751 or visit www.lakecleanup.com.